Killmonger #1 Review – AiPT! See the origin story of the Black Panther’s breakout antagonist! Anyone who has followed the Black Panther comics or seen the incredible film adaptation will be familiar with Erik Killmonger, the charismatic villain and would-be usurper of the Wakandan throne. Audiences will also know that Killmonger’s coup was destined to fail when he went against the Black Panther, but writer Bryan Hill’s new miniseries will fill in the gaps of how young N’Jadaka went from scared young boy to bloodthirsty revolutionary. Fans who have been clamoring for further examination of this intriguing character will not be disappointed by this first issue. This issue focuses on Erik’s first failed assassination attempt against Ulysses Klaue, the man who killed his father. Following a battle against a group of assassins calling themselves Rook, Knight, and King, Erik joins their ranks in order to expand his base of power and gain more resources to aid in his vendetta. The first thing you’ll notice with this book is that the artwork is astounding. There’s a grittiness to the “present day” scenes of Erik beginning his quest, while the flashbacks look closer to watercolor, a style befitting the haziness of memory. Erik Killmonger has been cursed to learn about his true nature and heritage in scraps, so his recollections are suitably piecemeal. The action sequences, while brief, have a brutal intensity. None of these combatants (save for maybe King) are looking to show off. Everyone is on a job and accomplishing that job in a timely manner leaves no room for making pretty corpses. This is definitely a book for mature readers. Killmonger is a character with strong convictions and a righteous fury. His pain and rage are understandable, even relatable. His anger is palpable in every panel. Even when Erik is smiling, Juan Ferreyra’s artwork portrays a kind of silent torment behind the man’s eyes. Killmonger’s thirst for vengeance is derived from a deep-seated feeling of being wronged. Long before he learns that he’s been robbed of his claim to the mantle of the Black Panther, he has been robbed of his father. More than that, he’s been robbed of tradition, of anything concrete to hold onto, other than his mission. Even his faith has been stripped from him, as explained in a gorgeously illustrated sequence where Killmonger strains to imagine the warriors’ purgatory his father told him stories of when he was a boy. It’s this need for personal justice and that drives Erik and informs all of his choice, as hot-headed and shortsighted as they may be at times. The first decision we see him make in this issue is to turn down prestigious career opportunities. He doesn’t want any handouts from a culture that has oppressed him and his race. He’s a genius and a warrior; he takes what he wants, never satisfied with what he’s “allowed.” It’s a fascinating insight into the character and I cannot wait to see the rest of his journey. 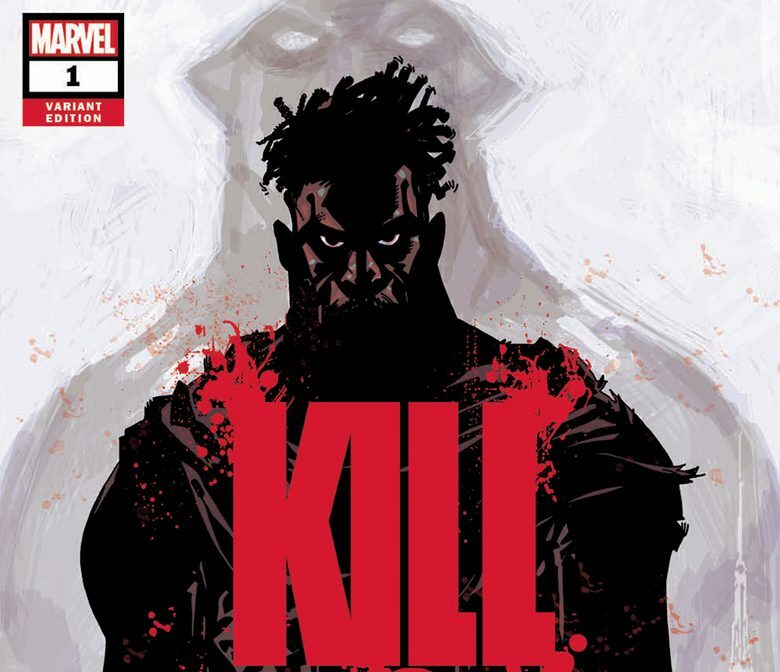 We all know how it all will end for Erik Killmonger, but if this first issue is any indication, the road to hell is looking to be quite a ride.